The trend of significant drops in break-bulk ocean freight rates has intensified since reported in last month's Wood Matters (see Freight Looking at Providing Relief to Beleaguered Forest Owners). Below is an updated table of the DryShips Inc. Baltic Dry Index (BDI) for a range of ship sizes. These prices are US$/day charter rates. The BSI T/C Avg. is the Supramax ship size closest to the Handymax and Handysize that carry NZ logs to Asian markets. This index has dropped from US$67,976 a year ago to US$19,283 as of 10 October 2008 - a massive reduction to less than a third of the value a year ago. In the current environment we are seeing drops of 20% in one week. According to Galbraith's (international ship brokers), high inflow of new-built ships and record stock piles of iron ore in China are two of the leading factors driving shipping rates lower. In addition, the current global credit crisis is no doubt bearing weight on freight forwarding demand. "Because ships are fixed in advance of log supply and log prices are set monthly, we have not yet seen the full extent of these ocean freight rates flow into at-wharf-gate prices for NZ logs", says Peter Weblin, PF Olsen's Marketing Manager. "We also expect this volatility to affect the various log traders differently, depending on whether they fix short or long in the market. This reinforces the value of our flexible marketing model. We can move volume to the log traders that are paying the best price, rather than having to accept lower returns for traders that may have picked the market wrong". The really big question, however, is will Asian demand and log prices hold up sufficiently to enable NZ forest owners to take advantage of the much lower freight rates? 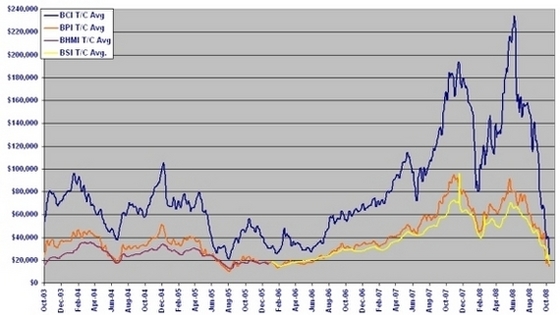 And will the domestic log market be sufficiently robust to take the non-export volume? The other issue is the impact on the container log trade, as featured in last month's WoodMatters (see Exciting New Logistics Initiative Provides $20/JAS m3 Cost Savings). The recent increase in the volume of logs being shipped in containers is partly based on lower freight rates available from back-loading containers. Whilst container freight rates have not fallen anywhere near as dramatically as break-bulk rates, there is plenty of room for shippers to drop the price of the back-load journey. "How this plays out in terms of future shipping patterns for logs is unclear", says Weblin. "However, its pleasing to be making decisions related to which freight mode is dropping the fastest, and, once again, our flexible marketing model will allow us to allocate client logs to those that can pay the highest at-wharf-gate price". The photo below shows client logs being stowed into containers in Dunedin for export via Port Chalmers. 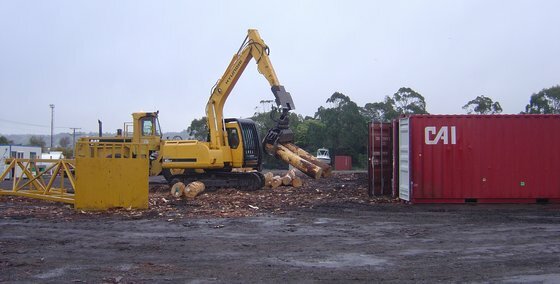 The yellow device on the left (looks like a bridge span) is used to ram the logs into the end of 40 foot containers. We understand that getting the logs out at the other end is rather more difficult!